Now that Halloween is over we are officially inundated with all things Christmas. Yes, I LOVE Christmas but it makes you wonder if Thanksgiving feels a little neglected. But whether you put up your Christmas decor the day after Halloween or wait until Thanksgiving has gotten it’s fair share of the festivities, do what makes your heart happy. 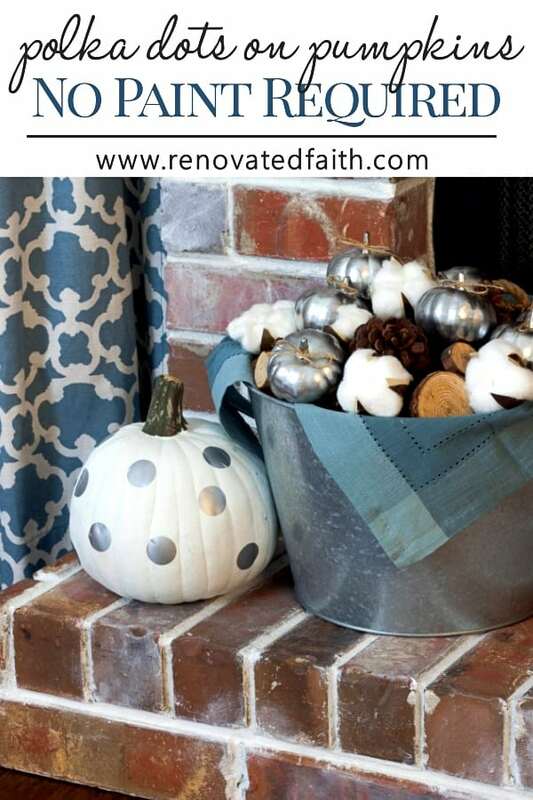 Maybe you cherish every bit of pumpkin goodness until December or maybe you skip Thanksgiving decor altogether…regardless…YOU DO YOU, my friend!!! 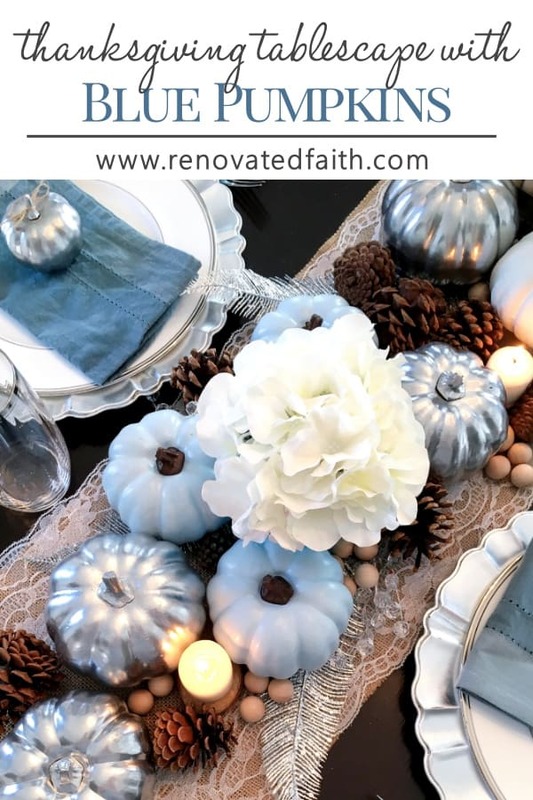 Last year, I wanted some simple thanksgiving table decorations that went with my existing decor so I painted some dollar store pumpkins in silver and blue (Behr Sonato in Satin Latex). It’s true that you can have an elegant thanksgiving tablescape without spending a lot. 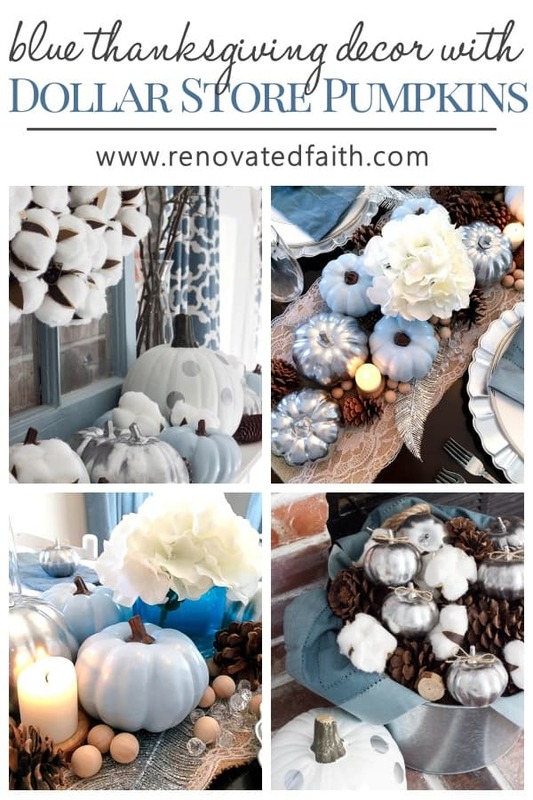 To see more of my Thanksgiving Tablescape with blue pumpkins, you can click here. I loved the look so I decided to add the same decor to my mantel. 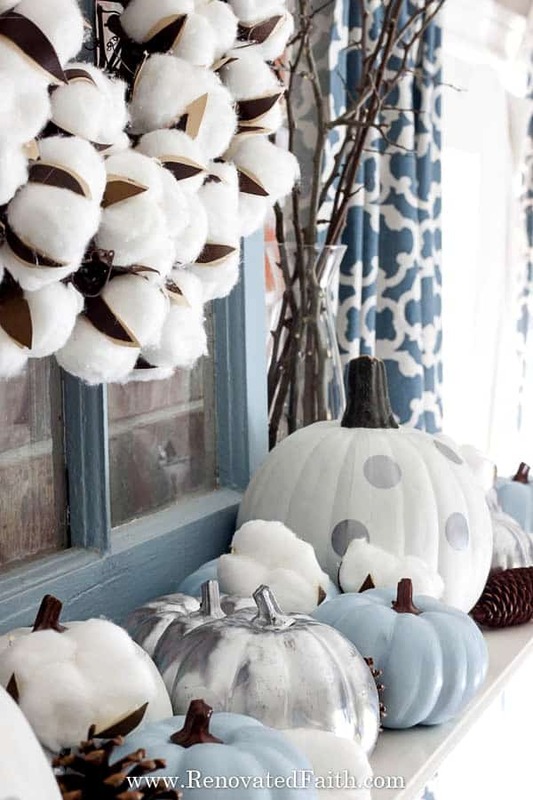 I painted dollar store pumpkins with blue latex paint and then spray painted some in metallic silver spray paint (click here for the brand I used). 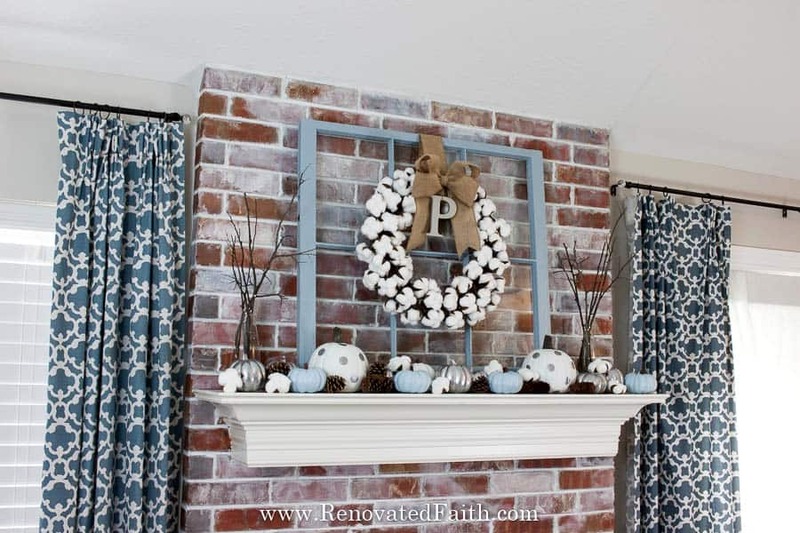 I was also able to incorporate the cotton wreath I made in my post Easy, DIY Cotton Wreath for under $10. 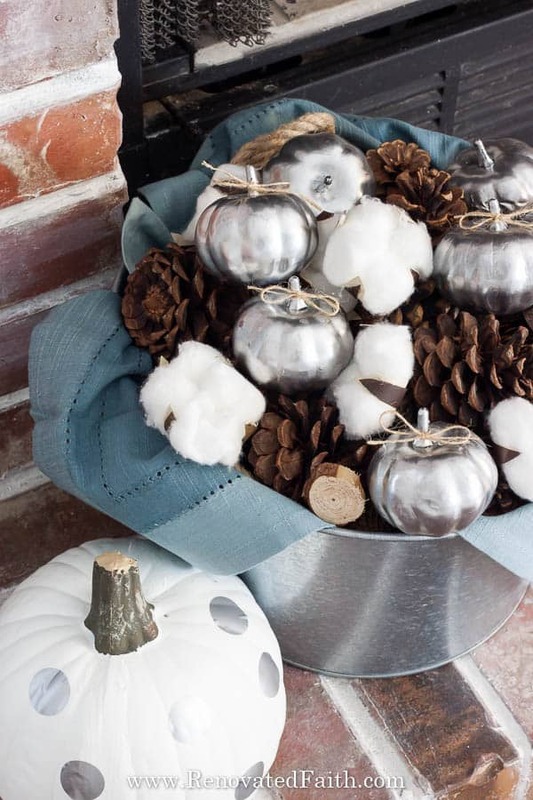 Cotton wreaths and stems are so versatile and can really work for any season. Didn’t it turn out cute?!? 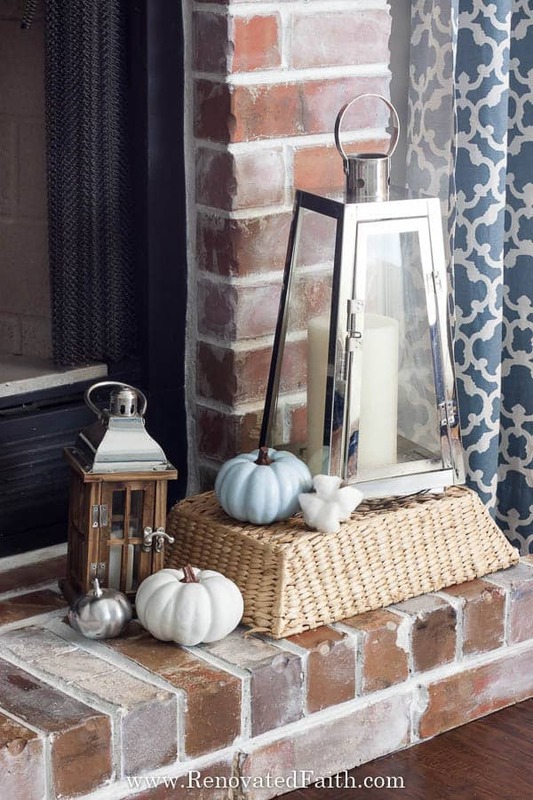 I used an old window I had already painted in, you guessed it, Behr Sonata Blue – the same blue I painted my pumpkins! I added a burlap bow and hung the wreath over the window, securing it with thumbtacks on the back side. I also integrated some sticks in vases (from my backyard!) 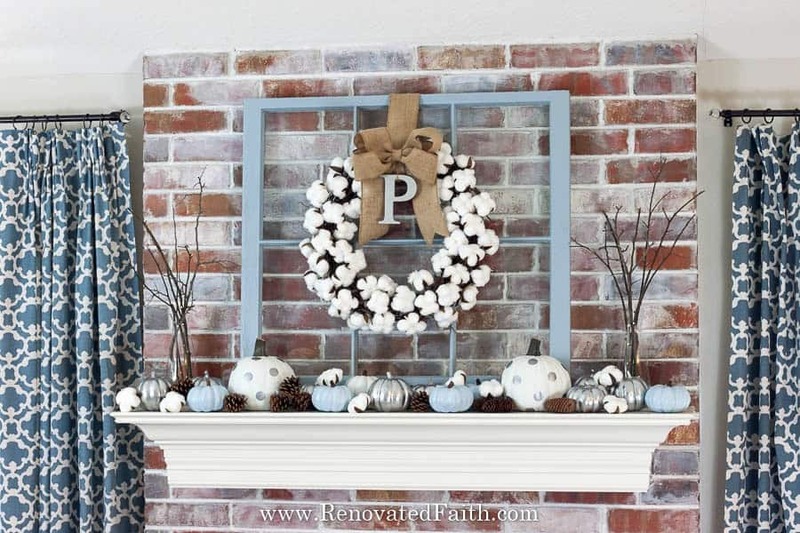 and some pine cones to give the mantel some contrast. 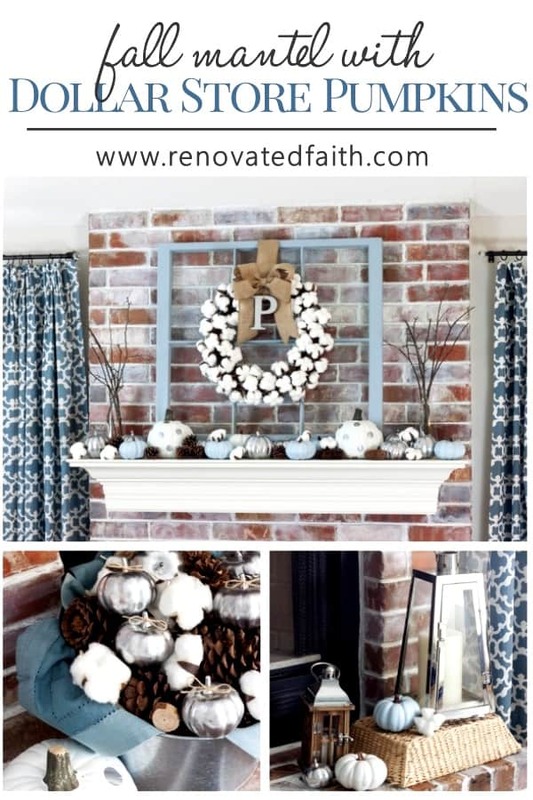 Again, I love decor that is versatile for more than one season as I’ll use my pine cones and cotton bowls in my Christmas decor also. 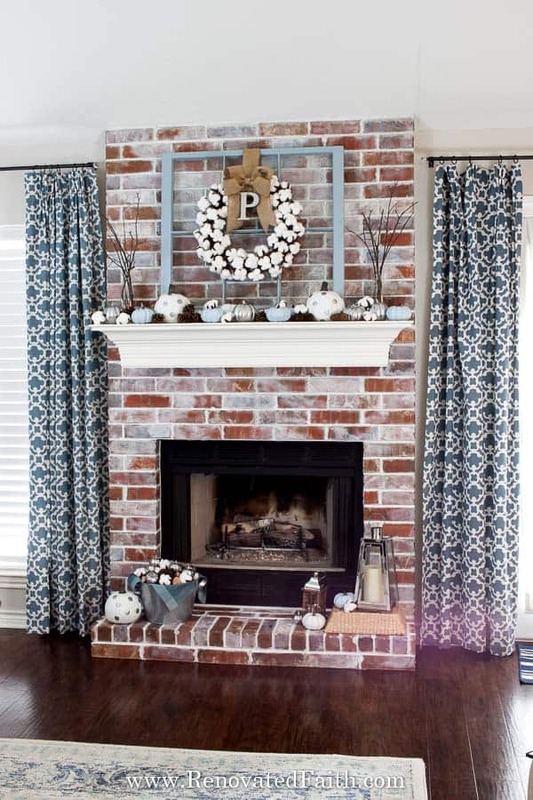 This is the faux finish I JUST finished on my fireplace in my post How to Whitewash a Brick Fireplace. You can click here to see the before. I’m still surprised by the transformation when I walk into our living room! It’s amazing what a little paint and glaze can do. Although life isn’t always ‘polka dots and blue pumpkins’, I’ve come to implement a practice in my daily life to help me overcome stress and anxiety. Every morning, I like to spend time in prayer and Bible study. But honestly, at times it is difficult to focus because of anxious thoughts that swirl through my head. So, after dropping off my daughter at school, I start each morning with a blank piece of paper from my notebook and write at the top: “What Am I Anxious About?”. Then, I spend a few minutes doing a brain dump, where I unload my greatest stressors on that piece of paper. 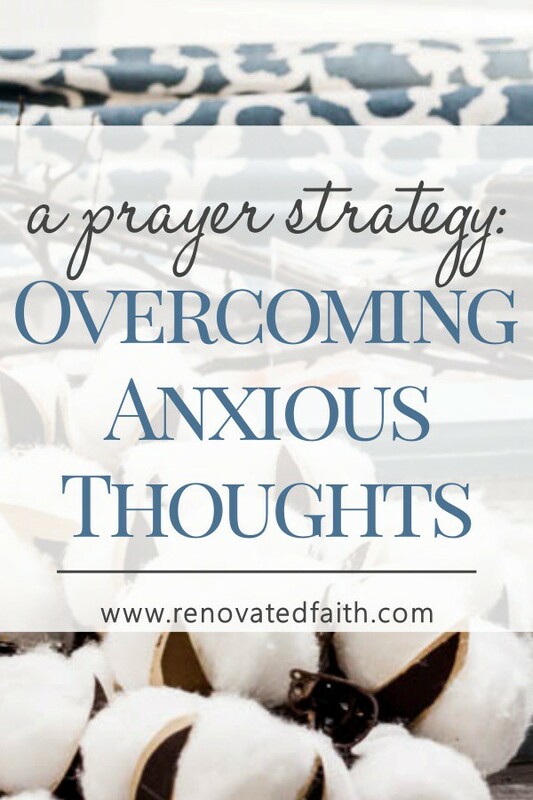 After I write them down, I pray through each, one at a time. As soon as I have prayed about each item on the list, I take a second to right out something I’ve thankful for in regard to that stressor. 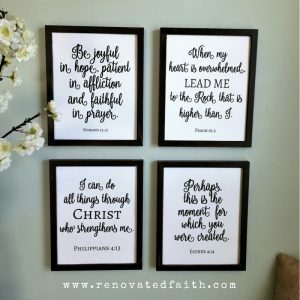 By writing what I’m thankful for, I can look at this stressor with a sense of gratitude to know that God IS working in the situation and that it isn’t as bad as it seems. In spite of my emotions at that moment, God is in control of the situation and working all things for my good (Romans 8:28). And here is my favorite part of this exercise: The next day, go back to the previous day’s list. And I promise, you will see that God has already worked in at least one of those items, if not all of them, in the last 24 hours! I also painted some larger pumpkins in a matte white with this spray paint. Before spraying, I used painter’s tape to tape off the stems because I wanted them to stay brown. Then I just simply stuck on these vinyl stickers (right now there’s a coupon!) instead of painting on polka dots. I just stuck them on and kept smoothing them out if they didn’t immediately lay flat on the curvier parts of the pumpkins. It was so much easier than getting out silver paint and a spouncer. Also, I think the results turned out better too! Want to save this post for later? You can pin it here!